Issued at 2:43 PM Friday, 12 October 2007. The Bureau of Meteorology warns that, at 2:45 PM, severe thunderstorms were detected on weather radar near Moogerah, Cunninghams Gap, Dalveen and Oakington. These thunderstorms are moving towards the east to southeast. They are forecast to affect Boonah, the area between Boonah and Beaudesert and Leyburn by 3:15 PM and Stanthorpe, Beaudesert and Tamborine by 3:45 PM. this is what the cell looks like atm lookes meaner than in the pics though. It looks as though this strong change will thoroughly clean things out for a week or so right along the entire east coast Mike. Unlike northern NSW and QLD, here in Sydney we really have not gotten into the juicy air yet, and usually don't until November - so last night, being the first warm season storm for us, was a pleasant surprise. Afternoon and evening of 11 October a cluster of thunderstorms had developed over the eastern areas of the central west slopes and plains and north west slopes. Looking at the GPATS lightning data between 3 and 4 pm there were 19,625 lightning flashes and strikes occurring from this cluster and from other cells in Queensland. The Bureau of Meteorology issued a severe thunderstorm alert on the cluster of storm cells over eastern NSW for a while. By 7 pm I was watching anvil crawler lighting from at least 4 cells sitting over the Blue Mountains. At around 8.30 pm, a narrow line of storms swept over Sydney, with the majority of the activity being over the western and northern regions. They were not severe and rainfall was light around 2 mm on average however a more intense cell developed over Sydney city CBD producing 8 mm of rain. Majority of lightning that occurred was intra cloud however I observed 3 cloud to ground bolts and one solid bolt produced a significant amount of noise that was close by. I discovered that I cannot take lightning photos with my digital camera (Any advice here) because it is too slow. The storms cleared the coast by 9.15 pm and they were moving relatively fast. I observed an increase in lightning flashes out to sea from the same cell later on. Two small thunderstorms moved across Sydney's far southern fringe between 9.30 am and 10.30 am. One was severe warned and there were reports of 4 cm hail at Camden and 2 cm hail from Heathcote. Another torrential shower cell moved over Auburn at 1 pm although I did not hear any thunder from it. The cloud had the hallmarks of a thunderstorm cell but I did not observe lightning. At 5.50 pm a small shower cell developed and moved over Blacktown tracking NE producing large raindrops but produced 3 lightning flashes and 3 thunderclaps before weakening. No further activity occurred afterwards. While not on the same calibre as that in northern NSW, the weather system did produce several storm cells of varying intensity for us. As mentioned earlier in this thread, a storm passed through 12.30 to 1am. I woke before the storm hit so was able to set the camera up. The CGs were infrequent but a couple were quite close. The rest of the day held some great potential but two factors conspired against a decent outbreak of severe weather in NE NSW and SE QLD. The shear was very linear with nearly all WNW winds. A bit of coastal northerlies were certainly needed. 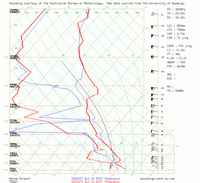 Regardless of the shear profile, there was great instability and plenty of low level moisture. 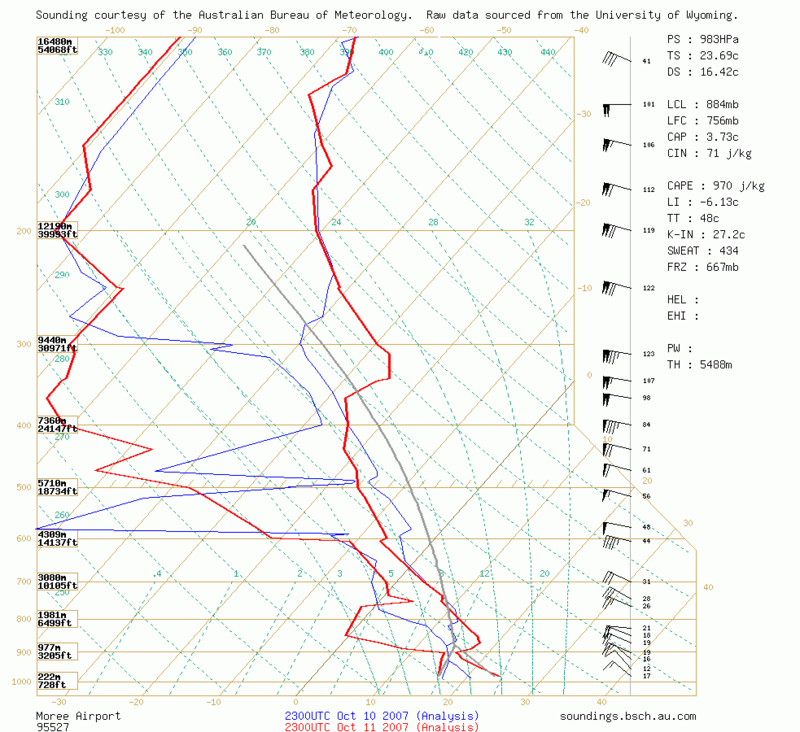 The main negative was a big inversion at 350 hPa. An upper level high was stronger than anticipated and kept upper temps at ridiculously high levels. Still went out on chase of course ! Rodney Wallbridge and I headed out to Casino then intercepted a severe storm just south of Wiangaree (north of Kyogle). A few close CGs hit nearby just before the cell produced a microburst near us. The winds gusted to probably 90km/h. We heard - and then saw a tree fall over (though it was pretty dead looking). However, a large tree was across part of the Summerland Way as we headed back. Rain was torrential but there was no hail at our location. Well there may have been the odd small stone. We ended up with two storms hitting the gold coast on fri 12th oct in the afternoon pretty much back to back( well it seemed like 2 seperate ones i could be wrong) i posted pics up of what the first one looked like while it was developing, here are pics of what it looked like coming over. It was quite impressive from carrara, we had some heavy rain here and a couple of wind gusts which managed to down a tree nearby. The order of the pics is basically what it looked like in stages coming over the complex. MB Edit - moved your post to this thread and resized the pics. Beautiful laminar structure to that shelf cloud James. Not surprising you copped some severe wind gusts from it.